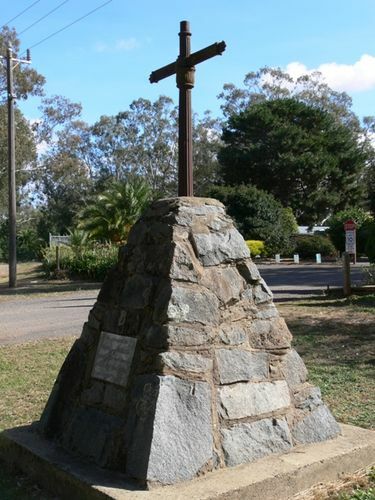 Cairn erected in memory of Hume and Hovell who passed through the area in 1824. Hume and Hovell camped near this spot on 28 December 1824. In order to obtain as much publicity as possible for the centenary celebrations of the Hume and Hovell exploratory journey through Victoria, Mr. W. F. Gates, a member of the organising committee, has broadcasted from 3LO the itinerary to be followed by the party which left Melbourne this morning to unveil monuments at the best-known resting places of the explorers. On Sunday a monument at Bent's Lookout, Buffalo, will be unveiled. From there the party will proceed to Beechworth, unveiling tablets at Myrtleford, Whorouly, Everton and Murmungee en route. On Tuesday six monuments between Stanley and Wodonga will be unveiled. Wednesday will be spent at Albury, where the Governor of Victoria (Lord Stradbroke) will preside over the functions. The party then turns southward, and unveils cairns at Violet Town, Euroa, Avenel and Seymour, whilst a section of the party turns aside and visits Tatong, Yark and Yea. The places nearer Melbourne are holding their celebrations on the actual days that the explorers passed through their districts— 13th to 16th December. The culminating point is Lara, where an imposing statue is being erected in a prominent position on the Geelong-Melbourne road. Age (Melbourne), 15 November 1924.